The Porsche 959 was the first true supercar made by the German car maker. Sure Porsche had made some very fast road cars, such as the 1973 Porsche 911 Carrera RS 2.7 and the 911 Turbo. While very fast, they weren’t necessary supercars. These special cars would be considered borderline supercars, but the first fully recognized production supercar made by Porsche was the 959. When the special vehicle was made it was so quick that Ferrari had to respond with another legendary supercar, the F40. Due to vehicle safety regulations that would require multiple 959s to be wrecked in crash tests, the supercar was never officially offered for sale in the United States. Bringing the Porsche 959 to the states legally is largely due to Bill Gates for helping to get congress to pass the show and display law. In the late 80’s when the 959 was first released it would have cost the equivalent of $225,000. Even at this price the Porsche was so far ahead of its time that this high price tag was only about half of what the car cost to build. Recently a wrecked 959 fetched $425,000 at auction. When you figure that examples in good condition go for between $900,000 and $1.5 million, that seems like a potentially a good investment (although the restoration bill won’t be cheap). 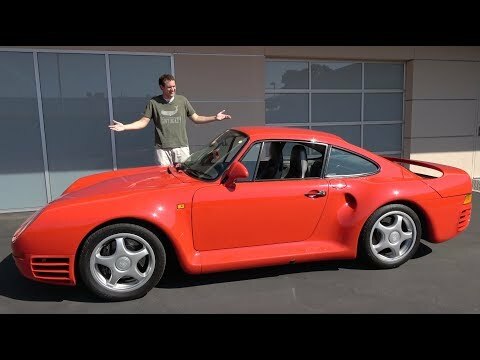 Considering that the Porsche 959 in the late-80’s could go 0-60 mph in 3.7 seconds, which is still pretty quick today, you start to see just how ahead of its time the 959 was.